In 16th Century Ireland. Young and beautiful Alainn McCreary, healer in training to the powerful O'Brien Clan, is on the cusp of discovering she possesses vast and unusual supernatural powers, which she hopes will help her unlock the secrets of her past and break the curse on the O'Brien Clan. Alainn is counseled to hide her magical abilities, but how can she when dark forces rise up to threaten not only the O'Brien Clan, but Alainn and the life of the Chieftain's beloved, but forbidden nephew, Killian O’Brien, a man Alainn has loved as long as she can remember? 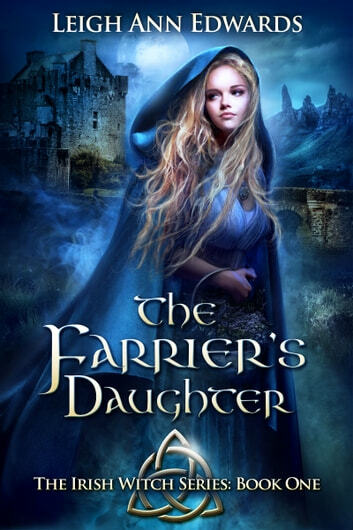 The Farrier's Daughter by Leigh Ann Edwards is a fantasy romance story. The Farrier's Daughter is book one in The Irish Witch Series and is not a stand alone book. Book two, The Witch's Daughter takes of where The Farrier's Daughter ends. So if you don´t like "cliff hangers" or this type of stories where they simply continues from book, to book, don´t begin on this series. But, if you on the other hand love fantasy romance stories this one is a really good one. It´s well written, flows of the pages and you just want to keep on reading. It almost feels like a young adult type of story. The characters are younger but it is also set in sixteenth century Ireland so that probably explains the younger characters a lot. I have always enjoyed the fantasy/paranormal romance genre and this book doesn't disappoint. In the first 2 chapters, Leigh Ann Edwards sets the stage for the deep friendship that develops between her heroine, Alainn McCreary and hero Killian O'Brien as children when she uses her powers to help him regain the will to live after having lost his family in battle. Ten years later, both are grown; their years of friendship develop into love. Their feelings for each other deepen even as they know that they cannot be together due to their differences in social station. When Alainn's guardian and mentor passes away, the old witch in the fairy glade reveals a secret which may change her life forever and could be the key to removing the curse that the witch had placed on the O'Brien family years before. The one thing I did not like about this book was that it ends in a cliffhanger and cannot be read as a standalone. That said, this story grabbed me enough that I definitely plan to read the next installment, The Witch's Daughter, to find out what happens. I received a free copy in exchange for an honest review. "The Farrier's Daughter" by Leigh Ann Edwards is Volume one in the "Irish Witch" series. This is not a standalone and continues in the next book in this series. This is Alainn McCreary and Killian O'Brien's story. Alainn is a healer and has a hard time keeping quiet. Morag, a healer too, took Alainn under her wings and trained her in the use of herbs and portions. Usually girls no matter what status they have in life do not get an education, but Alainn was able to attend classes with the chieftain's sons and nephew. The chieftain's wife convinced her husband to allow Alainn to receive training since she was a healer. It was in their best interest to provide her with this education since Morag was getting old and they needed someone to carry on for her. Killian's mom and dad are gone so he is being raised by his uncle who is the chieftain. Alainn and Killian because friends. At first he sees her as a sister but that begins to change. Alainn has had feelings for him too. The problem is that they do not hold the same status in society so they can never be together. So, how will things turn out for Killian and Alainn? If you are into fantasy and witchcraft romance, then this is a story that you might enjoy. This is a different story than I normally read. It took me a while to get into the story. Alainn and Killian were likable characters, but there were some pretty reprehensible characters. I received a copy of this book from Tule Publishing in exchange for an honest review. I really enjoyed this book. The characters were well thought out and the plot and twists kept the book entertaining. I can't wait to read the next book in the series!